public-direct has no other items for sale. Works well for me if not sweating. I have used it a few times and have wasted quite a bit. I find my neck sweats and it comes off before I leave the house. When I am not sweating it works. I clean and use alcohol as suggested. I also used too long a piece at first. But it does work like I said if I don't sweat. The alcohol has to be completely dry. And takes a few tries to find out how to apply. And the tape is very sticky so stays a long time. Need to use rubbing alcohol first. Still pulls some neck hairs out even though I hairspray it and clip all my hair out of the way. 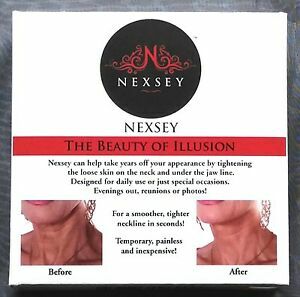 I love the results--gets rid of crepey thin skin (vertical small lines) Great for pics. Before and after pic (my neck skin is dry and peeling from Retin A) The tape feels very tight and secure. It is tricky and having someone behind you to help would be beneficial! It held for so long! I do seem to be allergic to the tape, though, and have bumps on the back of my neck! That won't deter me from using it when I want to look younger, though!